At a time in horror when “cattle-prod” scares seem to be the go-to device for scares, The Birds is a lesson in how to truly scare an audience. It doesn’t have any scares which make you jump at all but instead slowly builds and builds, always ramping up the tension until the final third of the movie when the audience is never left to settle. In classic Alfred Hitchcock style, the movie doesn’t seem to be about birds at all for at least the first act. 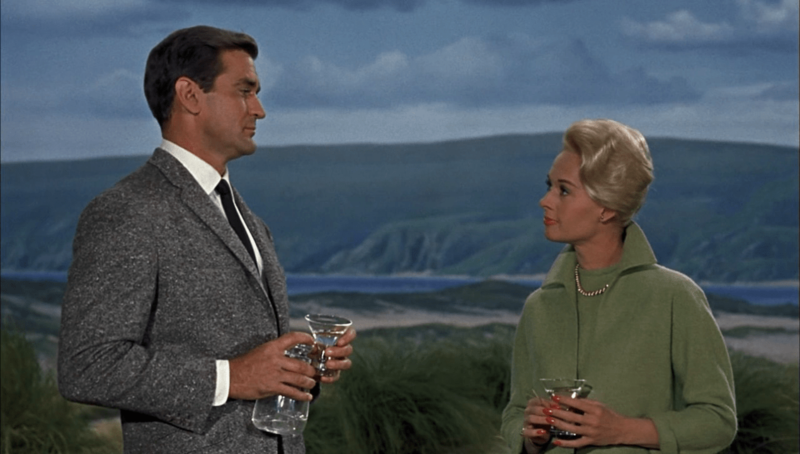 Apart from the odd moment involving birds, the film feels to be much more about Tippi Hedren’s Melanie Daniels trying to woo Rod Taylor’s Mitch Brenner. You would forgive Hitchcock for letting this sub-story become a generic love story but even in this tale you have a feeling of threat and unease, mostly through the almost jealous and possessive nature of Mitch’s Mother, Lydia, played in a very creepy way by Jessica Tandy. This story serves a great purpose as it means the threat from the titular birds can be developed slowly. Recent horror movies play their hand too soon and any threats are shown in the first scene but here Hitchcock takes his time, only hinting at any sort of threat from the birds. The attacks are small, inconsequential and easily dismissed; a classic horror movie trope utilised perfectly here. When the truth is realised, it is done in a deliciously horrible way. No cattle-prod scares, just slow reveals of the danger the residents of Bodega Bay are really in, showcased by a man with his eyes pecked out, covered in blood and feathers. It is a shocking image now but you can imagine the horror it caused in the early 1960s. 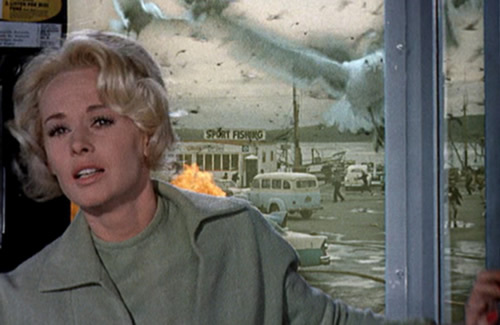 Hitchcock doesn’t relent throughout the whole film though and the use of real birds with others superimposed over the screen makes for a truly intimidating effect. At moments you can see the join and the movie has aged but there are also times when you can see the birds actually attack the actors and actresses, an example of Hitchcock’s obsessive and extreme nature. It works though and Hitchcock crafts some incredible moments within the film. The crows slowly building in numbers in a school playground or the attack on central character Melanie in the loft are both moments to dread and fear. All the attacks feel very real, especially the crows on the school children and although never gory, they can be difficult to watch. The finale feels like a psychological thriller. 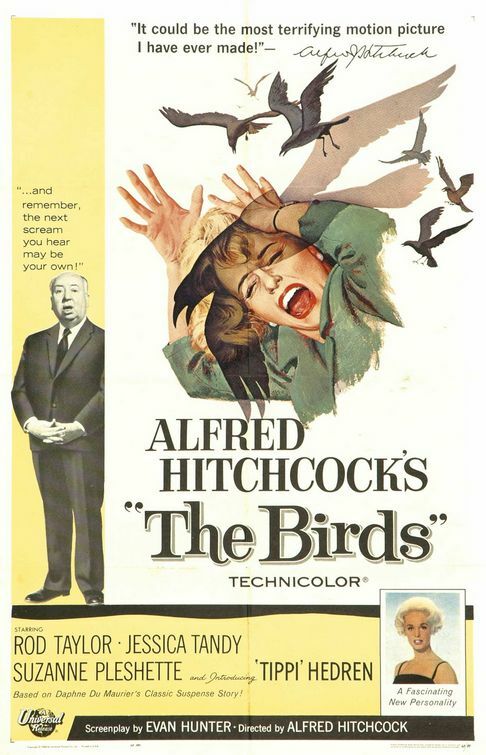 Many movie-makers strive to create a situation as tense as the one that Hitchcock creates at the end of The Birds and watching four characters slowly go insane as they wait for an imminent attack is compelling viewing. Add to this the final moments of the movie which will surely having even the most sure of composure holding their breathe for what could happen next. Overall, The Birds is a masterpiece in horror. It uses tension, slow-development and the right amount of build to craft perfect, scary moments. The action feels real and you won’t be able to look away, even in scenes which seem uncomfortable. The love story at the beginning shows promise but this fades away when the birds begin to attack. Hey Ben, I agree with this review whole heartedly. However you forgot to mention one important aspect that is a testament to Hitchcock’s genius. There is barely a note of background music in the whole film, not even in the beginning and end credits. For a filmmaker to create such tension without music is beyond the abilities of any modern filmmaker. There isn’t even music on the radio in the car. The only time we hear music in the whole film is when Melanie plays it on the piano in the home to break the tension that had been built and a short clip of the children singing at the schoolhouse. You’re absolutely right. I hadn’t necessarily noticed as I watched but when I did some reading about the movie afterwards I discovered this. It is amazing, especially when so much horror depends on the soundtrack these days. Every movie depends so much on background music, comedy, romance, drama…there’s music playing when you don’t even know it. No director would ever dare try this because it would lay their shortcomings out in the open.